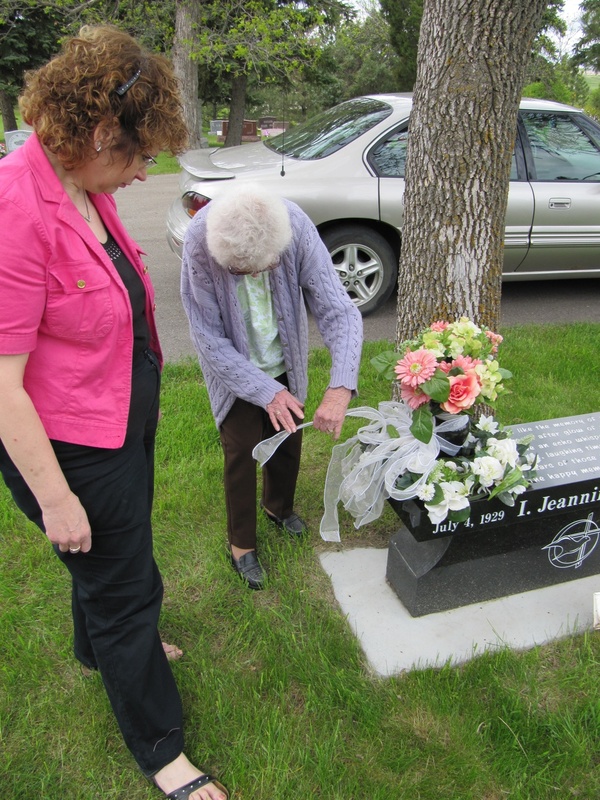 Aaron Barth’s mom and Grandma Barth put flowers on the grave of Grandma Christy. These are great moms. this, it is no wonder today that my mom eventually got into teaching commercial art to highschool students. Today she teaches graphic design to the up and coming artists within the Bismarck Public School system. My character was also shaped by two grandmothers, Vivian (“Larson”) Barth, and the late Jeannine (“Kulhavy”) Christy. Growing up, they answered to grandma, Grandma Christy, or Grandma Barth. I remember how it was always odd to hear their first names, Vivian or Jeannine. Upon hearing their first names, the thought that invariably ripped through my brain was, “That’s Grandma Barth, not Vivian.” My Grandpa Barth always referred to my Grandma Barth as “Mom.” I remember him often saying, “Let’s check with mom.” I knew what that meant: we had to go run it by Grandma. Information channels are important in households. My grandmas helped my parents out, at least with managing us grand-kids: we had infinite amounts of energy, only crashing for sleep when incapacitated by total exhaustion. When Grandpa and Grandma Barth looked after my sister, brother, and I, it always necessitated a stop at the supermarket to pick up hotdogs. When Grandma Barth started fixing lunch, she would always give me a cold hotdog straight from the package. This would ensure that my bottomless pit would not invert and implode on itself. Grandmas know these sorts of things. They’ve been around the block quite a bit. I don’t think people should use high-pitched baby voices when addressing elders. This was the generation that fought the Nazis and the Japanese Imperial Army. They survived the Cold War and everything in between. So just talk to elders in a normal, regular tone. They’ll respect you for it, and you won’t sound ridiculous. My late Grandma Christy lived at 718 N. 4th Street in Bismarck, and geographically this was about the middle of Hughes Junior High and Bismarck High School. I often lunched at Grandma Christy’s, at least in high-school. During junior high and during winters, Grandma Christy would treat my friends and I to a variety of soups (chili and wild rice are two that come to mind). These soups were made for supper, but Grandma Christy coincidentally prepped them in advance so they just happened to be ready when school got out. She liked to feed us. We liked to eat. It was a great set-up. Anyhow, this is just a short, localized and personal recounting of some individual episodes in Aaron Barth’s Great Mom History. Keep up the great work, moms. All these individual efforts are indeed important. Happy mother’s day. This entry was posted on Saturday, May 12th, 2012 at 3:16 pm	and posted in Uncategorized. You can follow any responses to this entry through the RSS 2.0 feed. Very touching story about your Mom, me and your Grandma’s.